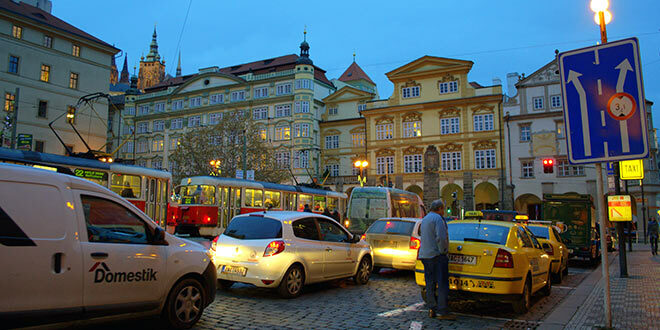 The worst thing for you in Prague will be the trams and buses. Keep in mind that you must give way to them at all times. Be aware that trams will be on your left and usually hard to see. Finding parking space and driving in the city centre requires quite a lot of patience, and you should be prepared for frequent jams etc, similar to other world cities. There are also plenty of one-way streets and no-turns. 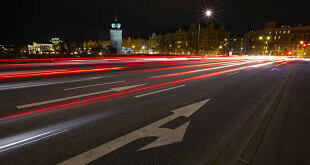 The road system and traffic handling in Prague is not the best, and definitely needs a lot of improvement. Drivers in Prague are also quite aggressive and not willing to give way unless they really have to. All Prague’s drivers seem to always be in a rush and ready to step out of the car or open a window and shout at you if you are too slow, or make some driving error. Occasionally, usually at night at some crossroads, the traffic lights controlling the junctions turn to “flashing orange”. This means that nobody has the right of way and traffic must sort it out for themselves. All vehicles are required to drive with lights on. Seat belts must be worn in front seats, and rear seats where fitted. Children under 12 years may not travel in the front seat. Speed limit on motorways is 130kph (80mph); minimum limit is 50kph (31 mph). All motor vehicles must have their lights on at all times, day and night. All passengers must wear seat belts, it is illegal to hold or otherwise use a mobile phone without a hands-free kit, and pedestrians must be given the right of way at crossings. If you’re involved in a car accident in which there is significant damage, or both parties involved do not agree about compensation on the spot, you must inform the police and must not move your vehicle until there has been a police inspection. If the cars have to be moved for purposes of safety, mark the original position of each car on the ground (chalk or lipstick will suffice). In case of emergency, motorists can call road traffic assistance (UAMK) on phone number 1240. They operate 24 hours a day, and can be called from highway telephones, located every two kilometres alongside the road. You can also flag down a UAMK van: they are yellow and bear the text ‘road assistance’. The Czech Republic has zero tolerance on drinking and driving. As an alternative to taxis, if you’ve driven somewhere and had anything alcoholic to drink and can’t (or don’t want to) leave your car behind, they’ll pick you up and drive both you and your car back home: +420 604 707 070 – Drink S.O.S.